Five days passed with him proceeding in the direction, he was told by the one-eared rabbitwoman. It took him further three days to leave the area, where the beastmen live. Once he came out from between the trees, the surroundings took the appearance of being a broad expense of various woodland. He occasionally climbed a tree to check his bearing. Hifumi noticed that the trees in the surroundings had changed. The atmosphere of the forest has changed as well, from a dry atmosphere filled with brightness and clarity to a damp and humid atmosphere, which is gloomy due to the overgrowing number of leaves. Also, the clear air, which allowed one to see into the distance without obstruction, transformed into something that appeared to be misty, before he noticed it. The number of trees having moss on their surface has become big and there are even those, growing different weeds from within their cracked rinds. Hifumi, who laid down after climbing on a tree’s branch to take a break from advancing through the forest at night, harboured thoughts like it’s unpleasant with the moss sticking to it while having no feelings of tension. In the sight of Hifumi, who headed deeper into the forest from early in the morning after spending one more night, a strange swelling, located on a tree, was reflected. Once he tries to get close quietly, he discovers a life-sized wooden doll having been placed in a sitting posture, as if entrusting its back to the trunk, close to the base of the tree. He grabbed the doll, which was covered in moss all over, but as it has been firmly stuck to the trunk, it’s not moving even an inch at the level of just pulling it lightly. It’s completely like a Buddha statue, which was created by cutting it out of one part of a large trunk. The slender-faced doll with its closed eyes was an elder having an expression with deep wrinkles engraved, however he had a beautiful form, which definitely would have peeked the interest of women in his person during his youth. And, the reason why Hifumi paid attention to this doll is its ears. The pointed ears have a size, which is more than twice that of humans. They are extending longly and narrowly while growing towards the back. Coupled with having a beautiful shape, they are a characteristic of elves, he heard from somewhere. Without clearing the moss he understands the feel of the material to be obviously wood. The minute way of crafting makes one believe that someone is sleeping. Even for Hifumi, who has no deeper interest in art, it was to a level of making him gaze at it for a while. What came flying alongside a sound of fast movement was a long arrow. The arrow, which passed the flank of Hifumi who moved his body sideways in a smooth, unhindered motion, pierced into the damp ground and blew up a small cloud of dust. Someone clicked their tongue due to Hifumi’s state of not being perturbed in the least, but they shoot another arrow from up in the trees. Even as he is attacked by a literally rapid firing of 2-3 shot arrows, seeing that he grasped the enemy’s location with the first assault, those couldn’t hit either. Smoothly avoiding the arrows, it ends once he hides behind a tree and holds his breath. The enemy disqualifies himself as sniper as it seems that they are the type, who lets their blood easily rush to their head. Getting annoyed with the opponent’s crude way of doing things, Hifumi launched a cross shuriken using only his wrist from within the tree’s shade. The sniper, who sustained a wound on their shoulder, fell from the tree unable to endure. He drops with a crushing sound on top of the leaves, which accumulated on the moist soil. At the time Hifumi rushed over, the enemy took out a knife and tried to take a fighting stance, but the point of the katana, which Hifumi drew, was by far faster and it was pressed against the throat as if being sucked in. The enemy, who looked at the nearby katana shedding an ominous light within the dim forest, gulped with their sight being drawn onto the blade. Being slightly taller than Hifumi, the enemy has long, slender and well-proportined limbs, though they aren’t frail by no means. The elf, with a hair style of slightly quirky, long blonde hair being tied and flowing down the back, had androgynous features having good looks and almond eyes. And, just like that doll, the elf has the characteristic long ears. The elf’s expression turns increasingly grim due to the belittling words. The elf, who opened his eyes in surprise, raised his voice. If it’s according to the details mentioned by the elf, the demon race is restricted in their coming and going because of the barrier, which has a shape of enclosing and sealing them in the elven forest, being deployed by the elves. Previously the dwarf Thorn has called them “the demon race, which is hostile to humans.” As result of those, having weak magic power, leaving the forest as they hate suffering the effects of the barrier, there are some, who got close to human cities. Zebul, who was killed by Hifumi, likely was the type, who was able to blend in between people without being discovered. Hifumi tilted his head to the side due to the elf completely acting as if they were applying the seal to protect the world. The elf says as if spitting out. Which reminds me, Zebul’s ears were long too, Hifumi recalled while mentioning his doubts. Watching the elf averting his look, he concludes the elves likely don’t have the strength to destroy the demon race, if it’s in genuine combat. Did the elf forget that a blade is pressed against his throat? The kick in order to hit with the shoe sole was avoided by Hifumi stepping back. Seeing that a distance opened up, the elf draws the knife this time and took a stance by holding it in a backhand grip. Probably due to the pain of a shuriken being stuck in the elf’s left shoulder, he clenches his left fist while frowning. Even as Hifumi shrugged his shoulders, several elves appeared from within the forest’s depth. 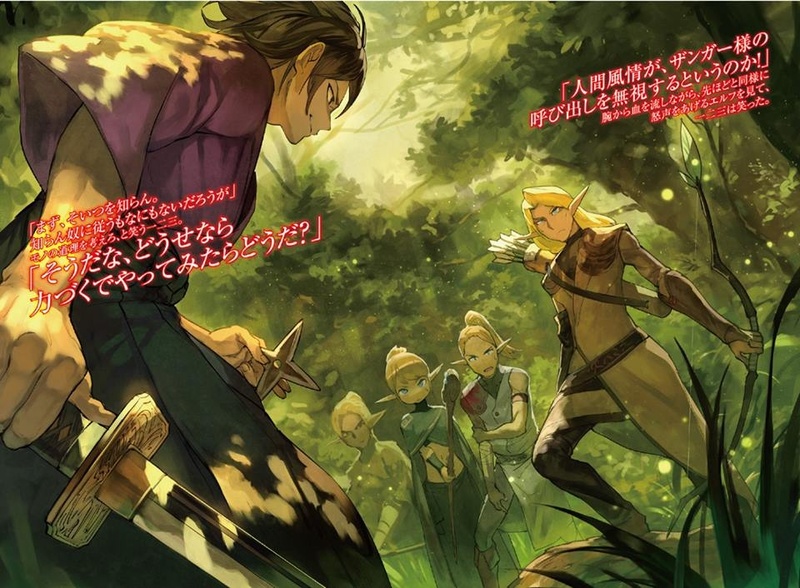 The male elf, who was in the lead, turned his bow, which was drawn to the limit, towards Hifumi and shouted at the elf, who has prepared his knife, in that state. The elf called Shiku dropped his shoulders with an expression like a scolded child. The following female elf began to cast healing magic touching Shiku. Due to Hifumi’s question, the elf, who yelled, faced Hifumi with a loathsome expression. Despite having arrows pointed at him at point-blank range, Hifumi is looking at the elves and arrows in front of him while holding the katana loosely without taking a particular stance. Once Hifumi waves his left hand, the bowstring is cut by a shuriken. Hifumi laughed as he watched the elf raise an angry voice just like before while shedding blood from his arm. “Think about the truth of the matter”, Hifumi laughs. The elf, who healed his wound with magic, drew the knife at his waist. However, what came flying first is wind magic. Hifumi boldly hit the approaching wind blade from the side with his palm. Making a sound of *pan* as if being repelled, the wind blade scatters. The elf, who released magic from the rear, floats an expression of shock. Come to think of it, the guy, who called himself one of the demon race, didn’t use a wand either, Hifumi remembered. As Hifumi is thinking Hmm, I see, he is mercilessly attacked by the elves’ spells. Not using fire magic in the vicinity is probably because they are paying attention to the forest’s trees. He slips through the fired wind blades and pellets as if whirling around in a dance. Once Hifumi got hold of the knife, which was thrust out by the elf, with his fingers, he turned over his wrist abruptly and stole the knife. And then he threw that knife. The knife deeply penetrated into the left eye of an elf, who just now was about to fire a spell. The instant the dead elf collapsed, the elf, who had his knife stolen, died with a single slice of the katana as well. Once he sees the sudden turn of events, Shiku drew back while being unable to stand up due to surprise and fright. Once Shiku met Hifumi’s gaze, he gave a short scream. In order to cover for Shiku, who had a tear-filled expression, the female elf, who previously used healing magic, stood in the way spreading bot her arms. While answering, Hifumi suddenly started to run. Passing the female elf sideways, passing Shiku sideways, he presses onto the two male elves, who stood further back. The two, who had been sniping Hifumi with magic from afar, aren’t able to do anything with Hifumi abruptly appearing in front of them. Hifumi, observed the surviving elves, which are dumbfounded. Due to his words Shiku’s body is trembling in fright with him only leaking foam from his mouth. Sighing, Hifumi asked Shiku about his age, but being nothing but scared, Shiku is unable to answer. Instead the elf woman replied that she’s 16 years old. The elven woman gulped due to Hifumi’s words. Speaking of something a young man could want from a woman, she can mostly imagine it. However, she has no strength to oppose him either. Hifumi, who sheathed the katana he wiped with a paper, dusted off the dirt from his hakama. Once the elf woman made Shiku, who is still in a daze, stand up by lending her shoulder, she tearfully abandoned her comrades’ corpses as they are and walked in front of Hifumi. The elf woman, who introduced herself as Puuse, explains the reason why it’s a grave taboo to damage the forest. Puuse is walking while carrying Shiku, who finally lost consciousness. Losing both parents as child, Shiku was raised by his grandfather since then, but a few days ago that grandfather died as well. “That’s why this forest is also called a graveyard by the elves”, Puuse says. Moreover, with their bodies beginning to turn into plants around the age of 100, the elves will stop to move in about a year. After that they will be completely integrated into a tree in approximately half year. It was different to the image of longevity, Hifumi held. As their growth is fast, they will grow taller until the height of an adult in around 12 years, though their physical ability falls behind. Even Puuse, who listened, understood that it was a non-committal reply while thinking about something else, but she didn’t ask any further. At this time the figure of the elven elder, whom he had seen being fused with the arbour, floated within Hifumi’s mind. No matter how you look at it, being assimilated into a tree is weird, Hifumi assessed. Even though it’s a fantasy world, it’s stuck in my mind. I want some answers until I can agree with it. Puuse wasn’t able to decline that. Truly you are the chaos, hifumi-san. Chaotic evil or chaotic netral or chaotic good? nah, it’s more of a chaotic neutral. Why he always have to meet a pair of girl :v ? Because, males usually talk with their fists (thus get killed) before Hifumi can have a decent conversation. Oh, the kid is a teenager elven male btw. I like this guy, showing who is the boss because he being OP, not hesitating to kill or defeat the opponents. Puuse? Hahaha what a name!! btw, I’ve been noticing some unnecessary comma in the sentences. even if those are in the raws, some of them can be removed since the grammar is not the same with Japanese and English. Hifumi found himself yet another harem member. Poor Origa. Thanks for the chapter, so why does he cares about the elf aging process at all??? The demons and elves are related huh? So different from the stereotype of transcendent entities Angels and Demons. Also rude bunch this young tree huggers is.